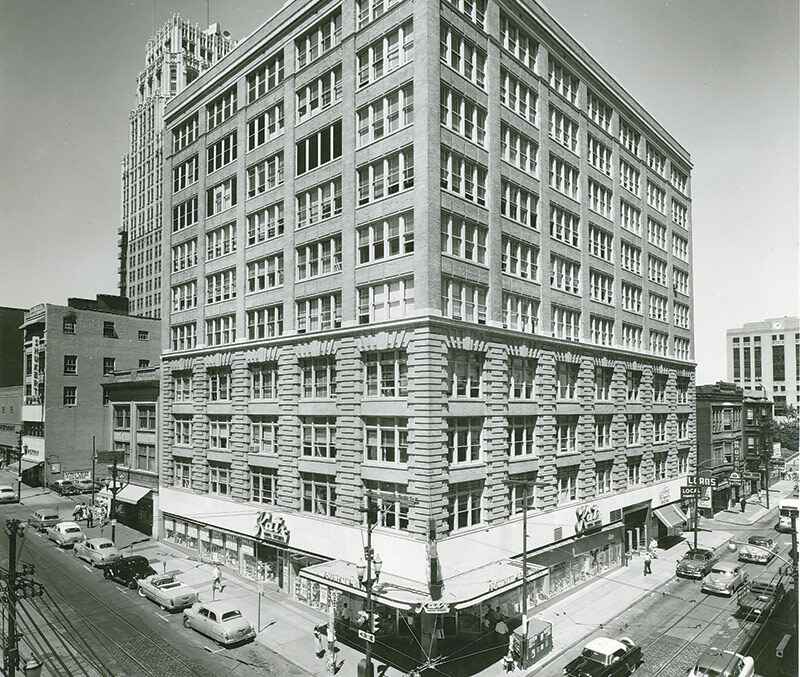 A historic photo of the Argyle building. Downtown Kansas City’s Argyle building, designed by renowned Midwest architect Louis S. Curtiss, has seen better days. Within the last six years, the Argyle has gone through two failed attempts at a revival. Now, a joint venture of local design muscle backed by a sports mogul’s fortune hopes to turn the corner for this 107-year-old, 10-story icon. The venture’s $19.5 million renovation will convert the long-vacant building into 102 apartments, complete with a new $300,000 skywalk to an adjacent city-owned parking structure with 150 leased parking spaces and 9,000 square feet of first-floor retail. Much of the building was gutted by previous owners, but the developers preserved the lobby and some of the intact hallways. Rosemann & Associates, a Kansas City-based architecture firm that specializes in existing and historic building projects, will design the project. Along with the PIEA abatement, which includes a 100 percent abatement for 10 years and a 50 percent abatement for the subsequent 15 years, the developers will seek state and federal historical tax credits. Louis S. Curtiss, once described as the Frank Lloyd Wright of Kansas City, was a pioneer in curtain wall design. His Kansas City practice had several local commissions, with works in Kansas, New Mexico, and Texas. His most famous building is the Boley Clothing Company Building, built in 1909 in downtown Kansas City; the structure is one of the world’s first glass curtain wall structures. SDG is currently completing the renovation to Curtiss’s former home and office into a mixed-use office and retail project across the street. The city Council will meet in the first quarter of 2013 to consider the parking agreement. But with such high demand for apartments in downtown, the project’s proximity to the civic center, and a written policy on the city’s books to increase residential development downtown, passage of the agreement is expected. Construction of the project is anticipated to begin in March 2013, with a completion date in the fall of 2014.